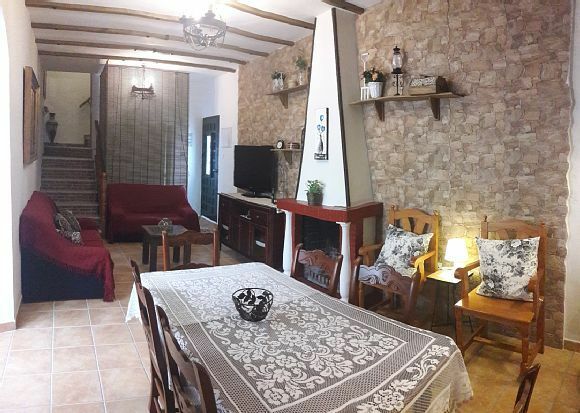 LA VENTURA, is a Rural House with two floors, with capacity for up to 9 people and distributed in 4 bedrooms, 1 bathroom, toilet, fully equipped kitchen with Eectrodimmesticos, living room with fireplace, terrace with laundry and a large interior patio. Located in an old mill in the town of El Bosque, has been largely renovated, respecting walls, distribution and existing spaces, thus maintaining the charm and flavor of the original building. The access from El Bosque is totally asphalted and only 800 m. of the Urban nucleus. Located in the Sierra de Grazalema Natural Park, next to the Alcornocales Park and within the Ruta de los Pueblos Blancos, it makes our property a privileged place. The environment is surrounded by abundant trees, between mountains and from where numerous springs used in yesteryear for the operation of the Mill flow. Even today, in times of abundant rains, you can relax while resting or start a new day, with the sound as background of the flow of water from these nearby natural springs. The house is accessed through a large exterior gate that ends after a passage in the Great Central Courtyard. This area, as well as the outside is ideal for meetings, barbecues, or the fun of the little ones if you are traveling with children. Is this where we find the entrance door ?. On the Ground Floor we access the common spaces; small hall, living room - dining room with fireplace, and with furniture and decoration suitable for a pleasant and comfortable stay; American kitchen with bar, fully equipped with the necessary household items and appliances; Toilet with Shower and access to the upper floor.? 1 Bedroom with 2 beds of 90 cm, convertible in bunk to gain space if desired. Finally and Annex to the house, with an independent entrance from the outside, we have a Warehouse Garage in case you need to store Bicycles, Kayaks, Paragliding or any other sports or other material with which you travel. The patio is common with another rural house located on the same property. Each house is completely independent and the patio has enough dimensions to maintain the privacy and independence of each group. Please respect your neighbors trying not to perform actions or noise that may bother others and interfere with the environment.? The house is completely independent, and all the rooms of the same have a window to the outside street, and the Hall of High Floor opens to the Central Patio through a balcony. This also ensures adequate ventilation, Calm and discretion timely to make your stay as comfortable as expected. La Paz y el Sosiego, is only interrupted at times by the sounds of nature. The rooms are equipped with individual heating and include bed linen (sheets, blankets and corks), as well as the necessary towels according to the number of guests. The fireplace is supplied with sufficient firewood for the first night, and depending on the number of days that you will enjoy the lodging. If you need more firewood it is easy to acquire it in the locality and surroundings. WIFI free for our customers. In case of choosing us, we hope you spend some unforgettable days in our Rural Accommodation. Do not doubt that all the actions and changes that we undertake, are with the only desire to improve your stay. ENJOY!!! ?